The protection of the fish stocks in Cambodia is paramount to the livelihoods of hundreds of fishermen that live and work along the Mekong River and for the staple food source of thousands more. For this reason, WWF-Cambodia has recently implemented the second in a line of training sessions to educate fishermen about their fish catch and monitor the populations of the fish species present in the Mekong River. The first of these training sessions took place in 2014 and if successfully adopted, more will be scheduled for the future. Members from the Community Fisheries (CFi)Committee in Kratie attended the two day training session which was organized by the Fisheries Administration Cantonment and supported by WWF-Cambodia, as well as the Scientific Capacity Development Initiative (Sci-Cap) in partnership with the Inland Fisheries Research and Development Institute (IFReDI), and the Fisheries Administration (FiA). The participants were taught how to monitor the size and weight of each fish species from their daily fish catch and how to record this information. The collection of such data is important because it is vital to understand fish abundance in CFi projects and the fish present, in order to safeguard the populations. This sort of monitoring programme needs to go on for at least 2 years in order to have enough data to analyze properly: it will all be compiled into a database and sent to the SciCap (Scientific Capacity Development Initiative) team in the US. 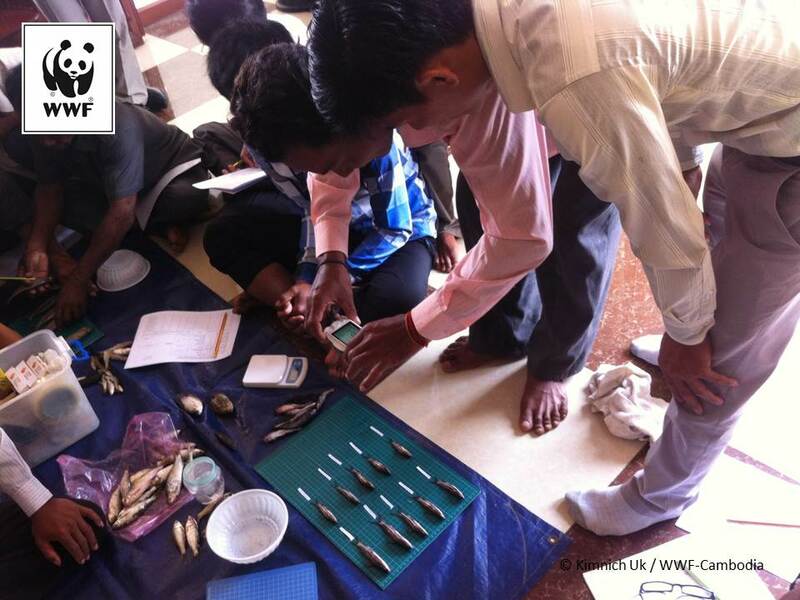 The overall purpose of the training was to give members of the Community Fisheries in Kratie the skills to become researchers/data collectors and help WWF-Cambodia in its mission to implement a fish monitoring project in the region. In attendance were fishermen from 10 CFis in Kratie (those supported by WWF IFReDI (Inland Fisheries Research and Development Institute)) and trainers from SciCap. Some of the fishermen selected had been present at the initial training session held in 2014 and some were being taught the data collection process for the first time. The training itself took place over two days, with the first day focusing on the primary data method assessment. This involved discussing exactly what would be needed to monitor a fish catch and the different equipment that would be used to carry this out. An introduction into the reporting method also took place on the first day. The second day went into more detail and showed the fishermen exactly what they would need to go away and do on a daily basis in order to feed their data back into the project. They were also taught how to interview other fishermen within the Community Fishery to monitor the data from their fish catch as well. The process of fish catch monitoring requires the fishermen to firstly divide the fish into each different species and record the numbers of each species caught. The fish are then weighed and photographed. Finally the tail fin is cut off of each fish and dipped in ethanol, with an ID marker to enable subsequent DNA testing. WWF-Cambodia wants to know the kilograms per month and per year of the fish caught in the Mekong River, and by collecting this detailed information a databank can be established. This data is important for conservation practices and will highlight any changes in species abundance over the course of time. The aim is for the data to then be sent to the FiA Cantonment in Phnom Penh – who work in collaboration with SciCap – for the final analysis. After the training session the attending fishermen have the skills and equipment to carry out this monitoring process on the fish they catch every day. They have been provided with GPS devices to monitor their catches as well as their locations and this data will be compiled over the course of the next two years. What is a Community Fishery? Community fishery establishment is a mechanism that can improve management of local fisheries and ensure local food security. In North-eastern Cambodia, WWF is working with Fisheries Administration and local government to assist local communities develop such community fisheries. About the Project: Inland Fisheries Research and Development Institute (IFReDI) have teamed up with (Sci-Cap) Scientific Capacity Development Initiative to improve Cambodian Mekong Fisheries Management through a collaborative project in fisheries monitoring.